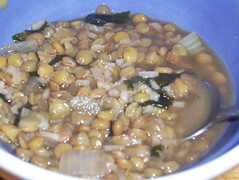 Traditional miso contains barley, a gluten-containing grain. However, there are some companies, such as Great Eastern Sun which make miso from alternate ingredients such as soy, chickpeas, and rice (their misos are also certified organic and kosher). 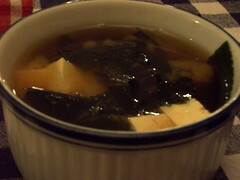 Additionally, as miso soup is usually made using a fish broth, using a vegetable broth in its place, makes the soup an option for vegetarian/vegan diners and those with fish allergies. This is a delicious gfcf, gluten free, family-friendly recipe! It is also (if you double check ingredients!) a wheat free, dairy free, egg free, tree nut free, peanut free, fish free, shellfish free, and vegan/vegetarian recipe. This is my adaptation of a couple easy miso soup recipes I’ve found. Make a quick batch of vegetable stock. In a medium pot, bring 7 cups of water to a boil with 2 cloves garlic, 3 baby carrots, and 3 leafy pieces of celery. Turn heat down to low and let simmer for 20+ minutes. Strain the vegetables out of the broth, then measure 6 cups of broth for the miso soup. Reuse the medium pot and bring the vegetable stock to a simmer. 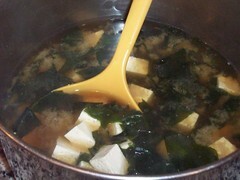 Add the diced tofu and wakame, and simmer for about 3 minutes. Remove from heat. Remove 1/3 cup broth from the soup, and dissolve the miso in the stock. 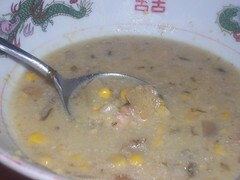 Once the miso is well mixed in with the broth, add to the soup. Garnish with scallion rings and serve. This is lovely served with a salad and sushi, but is also wonderful served with grilled tuna and Asian Rice Salad. This recipe can be made in the Crock Pot or on the stove, depending on when you decide to make it! 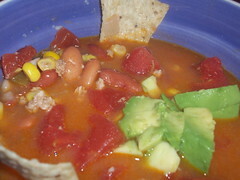 It is a favorite in our house, and wonderful served with corn chips and some avacado! This is a delicious gfcf, gluten free, family-friendly recipe! It is also (if you double check ingredients!) a wheat free, dairy free, soy free, egg free, tree nut free, peanut free, fish free, shellfish free, top 8 allergen free, vegan/vegetarian, and South Beach phase 2 safe recipe. This qualifies as faux-fast-food, as it will be ready in under 45 minutes! Warm oil in a a soup pot over medium heat. Add onion and garlic, then add ground meat when the onion and garlic start to soften. Stir until meat is browned. Add canned goods, seasoning packet, and 1 28oz can of water, and stir well. Turn heat to high, and bring soup to a boil, stirring intermittently. After it comes to a boil, turn to low and let simmer for 30 minutes or so. Serve with tortilla chips, guacamole or avocado, and sliced black olives. Warm oil in a skillet over medium heat. Add onion and garlic, then add ground meat when the onion and garlic start to soften. Stir until meat is browned. Add meat mixture to slow cooker, then add canned goods, seasoning packet, and 1 28oz can of water, and stir well. Turn heat to low, and cook for 6 hours. Serve with tortilla chips, guacamole or avocado, and sliced black olives. 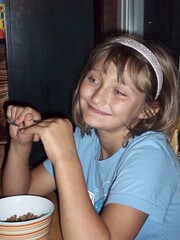 My oldest daughter has been asking for more vegetarian meals. This makes me happy, as we were vegetarian before the celiac and food sensitivities took over. My daughters needed a lot of protein, so we switched our diet. 5 1/2 years later, we are able to reduce some of our dependency on meat, so we are having at least one vegetarian meal a week. This is an inexpensive and delicious gfcf, gluten free, family-friendly recipe! It is also (if you double check ingredients!) a wheat free, dairy free, egg free, tree nut free, peanut free, fish free, shellfish free, corn free, vegetarian and vegan recipe. Bring the 2 oils up to medium heat in a large soup pot. Add celery and onion, and stir. Sauté until the celery and onion start to soften. Add all other ingredients other than the wakame, and stir well. Turn heat up to high, and bring to a boil, stirring occasionally. When the soup has come to a boil, turn the heat down to medium-low, and cover. Let simmer for 30 minutes, stirring occasionally. Check the water/broth level after 30 minutes, and add a cup or 2 of water if needed. Remove the kombu & discard. Add the wakame, and replace the cover on the soup. Let simmer for 10 minutes, then check rice & lentils for done-ness. This is a delicious soup that will really fill you up! This served 5 hungry people with enough leftovers for a few more meals. Have you ever started to make a recipe, only to find out that you are inexplicably out of half of the ingredients? Of course, we make do, but sometimes the “making do” recipes are wretched, and sometimes they taste better than the original. 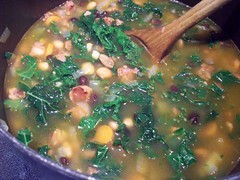 Here’s our “everything but the kitchen sink” soup that can help you clear out your crisper and pantry, and please your family all at once! It will also please you, because it’s as quick as it is fabulous. This is a delicious gfcf, gluten free, family-friendly recipe! It is also (if you double check ingredients!) a wheat free, dairy free, soy free, egg free, tree nut free, peanut free, fish free, shellfish free, corn free, top 8 allergen free, and South Beach phase 2 safe recipe. This can easily be a vegan and vegetarian recipe if you omit the meat. This is also a yummy recipe that will be ready in less than 45 minutes! Add the spices to the onion, & garlic mixture. As the meat (if using) starts to brown, add any fresh vegetables you have chosen. 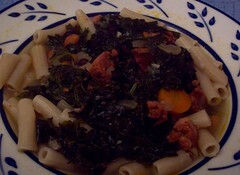 Stir until meat has browned and vegetables have softened. Deglaze the pan with the splash of wine, if using. 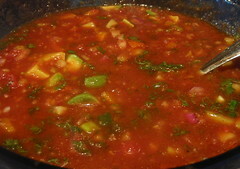 Add canned tomatoes, beans, and stock/water. Add 1 quart stock/water, then add 1 cup at a time until it looks soupy. Turn heat to high and bring to a boil. Add rice/noodles/lentils and any frozen veggies. Simmer 15-20 minutes (depending on directions on your dried good), test and alter seasonings, and serve. Yum! 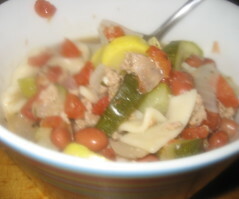 This hearty soup was inspired by a few things – my husband bought about 3 times the amount of ground beef that I normally buy, I had some odd amounts of vegetables around, and I was very chilly and wanted a warm soup with a new flavor. This cooks reasonably quickly and is a full meal in a bowl – a lot of bang for your buck! Warm the oil in a large soup pot over medium heat. Add onion, garlic, carrot, and bell pepper. Sauté until it becomes tender. 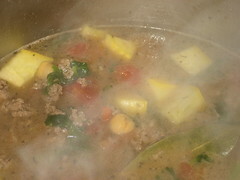 Add ground meat to the vegetables and stir intermittently until the meat is browned. While the meat and vegetables are cooking, add salt, pepper, and other spices. When the meat is browned, drain off some of the fat and add a splash of wine to deglaze the pan. Add all the ingredients except the water, and stir. Add 4 cups water, then 1 cup at a time until it looks soupy – the exact amount of water will vary. Bring to a boil. Simmer for about 15 minutes, check seasoning, then serve. My whole family loved this, and one of my girls asked for extra broth! Make this for thanksgiving. In our house, it is not thanksgiving without it. As a warning, though, I broke my crock pot with this soup (OK, it slid off the hood of my car), and my mom needed stitches from this soup. So be careful! Add squash, chopped apple and broth and bring to a boil. 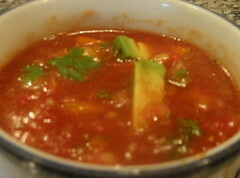 Reduce heat and simmer, covered, 25-30 minutes or until squash is tender. Allow to cool slightly. Remove the solids from the broth with a slotted spoon and puree in a food processor or in a blender in batches, adding broth as needed. It’s easier if you can use an infusion blenders right in the pot – less mess potential! The soup should be a velvety orange puree. Add cider to soup, stirring well. Correct seasoning by adding ground ginger, grated fresh ginger, and/or salt and pepper to taste. 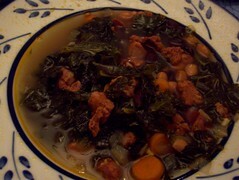 Serve in small soup bowls as a hearty first course, or with a salad as a light lunch or supper.